Sharing Christ using the Three Circles. Fifteen years ago we travel to Guabal in the Atlantic side of the Province of Veraguas, the roads were extremely bad and during the rainy season it was very challenging. At that time we met Marciano and his family, his oldest kids were between the age of 13-16; we visited them two or three times and started with them a family church. Now, after 15 years God opens doors for us to come back as the result of Pastor Heitor’s coordination for that area. What we found? All Marciano’s family are in church, two of his oldest son are taking the lead of this group, eager to learn and to love Jesus through the way they serve. 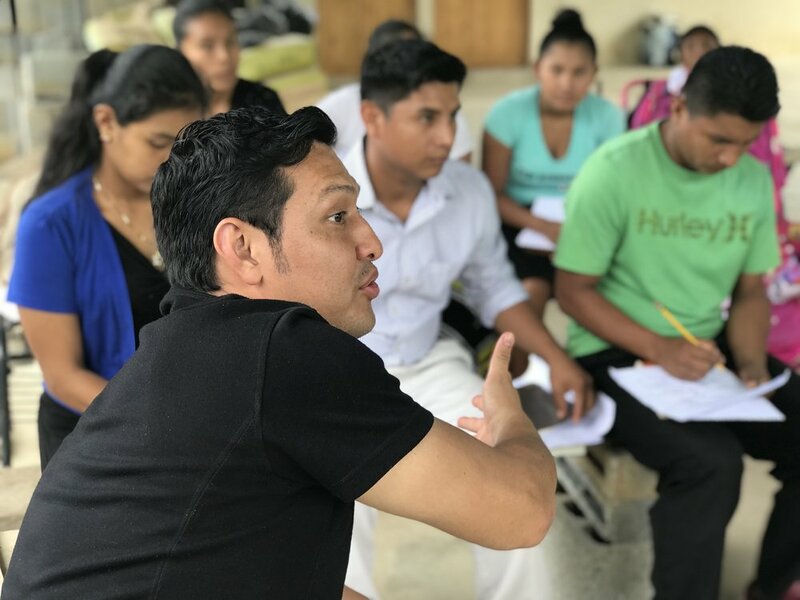 The ones that got together for the training were mostly the leaders and Pastor Hilario from a small community call “Piedra Chica” (Small Stone). All of them remembered Moises and welcomed the team with much love and openness. Edilton (one of Marciano’s son), was so but so excited that said, “My mind is about to blow up, this is exactly what we needed to share the Gospel, we knew we had to do it but these tools are what we all needed”. We agreed to return in order to give the following touches they need. With Pastor Hilario we agreed to give the touches at his village, which is about an hour hiking away, he said, “It is near, not far," well, if he says so, it has to be. The results are as follow after one hour of home evangelism, God allowed us to visit 8 homes, share the three circles with 15 from which 13 prayed to receive Christ and 2 rededicated their lives to the King and one healing after the team prayed for Evangelista. We thank the Lord for good weather, no one got sick, the five pana-eagles and Salvadorian sister (Aida) and her baby, that is correct Marc went out with us too (2yrs of age), they blessed the place and the people. Cann’t wait to return and see what God has in store for this place, since is the gate to conquer the villages in the Atlantic side of Veraguas Province. On our way back home, we stopped at the entrance of Santa Fe and met brother Isodoro, he is a Ngobe Pastor who founded and administers a nice hostel where people coming from the mountains to see a doctor or go into the hospital and need a place to stay, they can stay there. He has a great place where the Gospel is preached and many have come to know the Lord. He met Moises many years back and was a joy to sit and talk for while. Finally we prayed and ask the Lord for peace and blessings for those villages that need Gospel and for workers, so much needed. Thank you so much for praying and providing for the work in Panama to continue. I know that there are other ministries serving but God has allowed you and us to connect and we are grateful for that. In Him and until He comes back again. Talsy / Mission starts with you.